"Find Out How To Turn Your Articles Into Videos With The Click Of A Button!" Why video marketing is absolutely vital to your business, and why you should start using it right now! How to greatly multiply your traffic by integrating all of your articles into videos! How to use video marketing effectively in order to take advantage of millions of potential visitors! 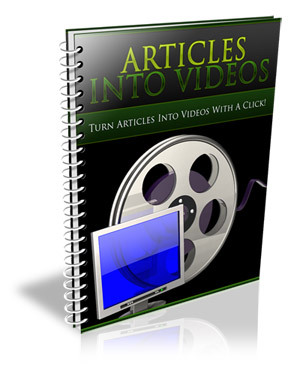 The brain-dead easy way to turn articles into videos with the click of a mouse… REALLY! And that's barely scratching the surface of what you will learn in this incredible report! This short but informative 10 page PDF report comes with Private Label Rights.